Growing up in Northern California, Tony was inspired by the first movie he had ever seen, Mary Poppins, and as a boy began drawing and making Super 8 films. His drawings earned him a full scholarship from the Disney family to CalArts, the fabled art school that had bred so many Disney artists. Tony arrived at The Walt Disney Studios at age 20, hand picked and trained by Walt Disney's "Nine Old Men", he focused solely on a career in animation. 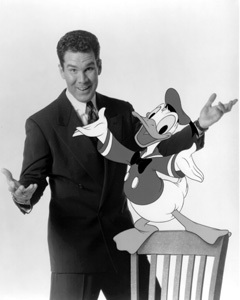 As a highly skilled animator, he worked on nearly every "traditionally" animated (hand-drawn) Disney feature from 1980 to date, however, it was his apprenticeship with Clarence "Ducky" Nash, the original voice of Donald Duck, that would eventually lead Tony to his second career at Disney: behind the microphone as Donald's voice.